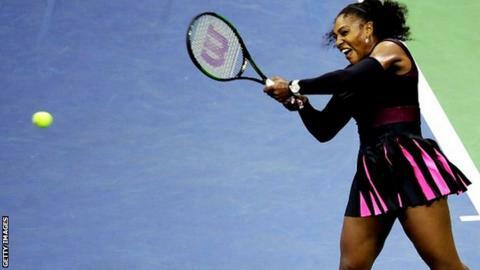 Serena Williams showed no sign of the shoulder injury that disrupted her US Open preparation as she dismissed Ekaterina Makarova in straight sets. The top seed faced a tricky first-round opponent in Makarova, Russia's world number 29, but won 6-3 6-3. Williams, 34, will monitor how her shoulder reacts before her second-round match against Vania King. "I'll have to wait until tomorrow to see - I haven't been able to play that much since Wimbledon," said Williams. "Every day I'll just see how it goes." Williams had played just three matches since winning Wimbledon, but impressed against 2014 semi-finalist Makarova in the night session. "I love coming out here in front of this New York crowd, it's super special," said the six-time champion, chasing an open-era record 23rd Grand Slam singles title. "I got off to a really fast start - I wanted to get some momentum." Venus Williams, seeded sixth, survived 63 unforced errors to beat Kateryna Kozlova of Ukraine 6-2 5-7 6-4. Fourth seed Agnieszka Radwanska and fifth seed Simona Halep lost four games between them as they progressed, while leading names Stan Wawrinka, Kei Nishikori and Juan Martin del Potro went through in the men's draw. Meanwhile there was an upset in the men's draw as 12th-seeded Belgian David Goffin was beaten 4-6 7-5 6-4 6-0 by 19-year-old American qualifier Jared Donaldson. Australia's Bernard Tomic apologised after making lewd comments to a spectator - the world number 19 insisted he was "baited". Tomic, 23, trailed Damir Dzumhur 5-4 in their first-round match when an exchange with a spectator began. As well as two explicit comments, Tomic said: "I will give you some money to make you feel good." Courtside microphones picked up the comments by Tomic, who would go on to lose 6-4 6-3 4-6 7-6 (7-0) to Bosnia's Dzumhur. "He definitely baited me the whole set for me to say that. But I do apologise," the Australian said of the spectator. "He was just sort of saying negative stuff. "I had problems on the other end, as well, with a few people in the corner. They were saying some negative stuff to me, in my language of Serbian-Croatian. "The microphones didn't pick that up. But I obviously caught the blame for that." "I'm getting old, I have to work a bit more on my serve, I guess," joked Croatia's Ivo Karlovic after being told he only hit 10 aces in the final set of his win over Taiwan's Lu Yen-Hsun. The 37-year-old set a US Open record with 61 aces on his way to a first-round victory - 22 of them in the second set alone as Karlovic passed Richard Krajicek's record of 49 set 17 years ago. "I knew there were a lot of aces because at one stage I was serving one on almost every point but I didn't know it was a record," said Karlovic. Italian Fabio Fognini called the US Open the worst of the Grand Slams after he was docked a point for removing a line judge's sunglasses in what he described as a joke. Fognini, 29, now faces a fine for his actions during Tuesday's 6-7 (9), 3-6, 7-6 (5), 7-5, 6-4 comeback victory over Russian Teymuraz Gabashvili. "They have their rules. You know, the Americans are different in every way," Fognini said.